: Scent hound used for hunting hare, fox, roe deer and wild boar. : John Miller and Raymond Triquet. 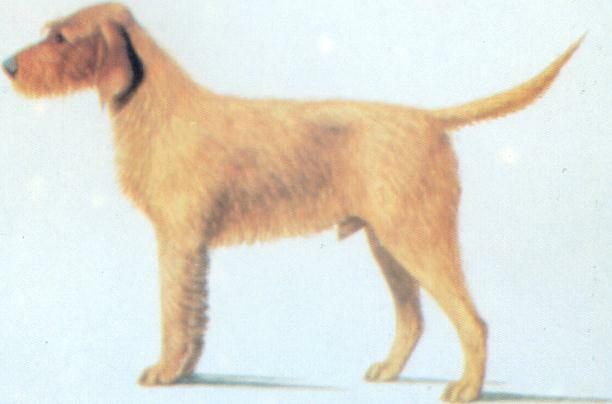 : The fauve de Bretagne is one of the oldest French scent hound breeds and as early as the XIV century a gentleman by the name of Huet des Ventes had a pack of these dogs. Much used until the XIX century for wolf hunting in Brittany, it suffered a decline when these animals disappeared. Striving to maintain the quality of these hounds, which had become rare, Marcel Pambrun founded the Club de Fauve de Bretagne in 1949. Since the 1980’s, under the direction of Bernard Vallée, the griffon fauve de Bretagne (as well as the derived breed, the basset fauve de Bretagne) has established a place among the French scent hound breeds. The motto “hunting first” continues to guide the club’s conduct. : A bony and muscular dog, very resistant to weather and fatigue. A quite active hound, particularly suitable to difficult terrain. It has good scenting ability and the sustained voice of a “chopper” (short and repeated notes). : Fauves de Bretagne are impassioned hunters but are good natured with people, sociable, affectionate and equable. They adapt themselves easily to all terrains and to all quarry. When hunting they reveal themselves to be courageous, wily, tenacious and steady. They are enterprising and efficient but show themselves equally capable of harking in. When well conducted, they are obedient and return readily. : Rather long, marked occipital protuberance. Seen from the front, the cranium has the form of a flattened arch and diminishes in width from the rear to the superciliary arches, which are not very prominent. : Black or dark brown; well-open nostrils. : Slightly tapering rather than being perfectly rectangular. : Covering well the lower jaw but without excess. Moustaches only slightly furnished. : The jaws and teeth are strong, meeting in a perfect and even scissors bite. The upper incisors cover the lower in close contact. The incisors are set square to the jaws. Absence of first premolars is not penalized. : Neither bulging nor set too deeply in the orbits, dark brown in colour. The conjunctiva is not apparent. The expression is lively. : Finely attached, in line with the eye, just reaching the end of the nose when drawn forward, ending in a point, turned inwards and covered by finer and shorter hair than on the rest of the body. : Rather short and well muscled. : Short and broad. Never swaybacked. : Chest: Deep and broad. : The underline rises only slightly towards the rear. : Carried slightly sickle-fashion, of medium length, large at the base, often bristly and well-tapered at the end. In action, the tail is carried above the top line and makes regular movements from side to side. : The limbs have good bone and are well poised. : Oblique and well set on the thorax. : In line with the body. : Seen in profile, somewhat oblique. Seen from the front, in line with the body. : Compact with the toes tight together, arched and with solid nails. The pads are hard. : Well muscled. The limbs are well poised. Seen from behind, the rear legs are parallel, neither close nor wide. : Long and well muscled. : Well let down and moderately bent. : Supple and even, never bouncy. : Rather thick, supple. Absence of dewlap. : Coat very rough, harsh, rather short, never woolly or curly. The face shouldn’t be too bushy. : Fawn coloured, from golden wheaten to red brick in hue. A few black hairs dispersed on the back and ears are tolerated. Occasionally the presence of a small white star on the chest, something not sought after. : Males and Females: 48 cm minimum (19”); 56 cm maximum (22”), with a tolerance of 2 cm (0.8”) for exceptional specimens. Head Wide, flat skull. Superciliary arches too prominent, Short or pointed muzzle. Heavy and pendulous upper lips. Body Frail in appearance. Topline not level enough. Too tucked up. Limbs Poor bone. Splayed feet. Coat Sparse, smooth, fine, soft. Temperament Aggressive or overly shy. Lack of type Insufficient breed characteristics, which means the animal on the whole doesn’t resemble other samples of the breed. Pigmentation Totally or partially unpigmented areas on the nose or the edges of eyelids or lips. Dewclaws Presence of dewclaws (this breed is always free from dewclaws). Coat Long, woolly coat. Any coat other than that defined by the standard. Height Outside the limits defined by the standard. Defects Noticeable invalidating defect. Anatomical malformation.